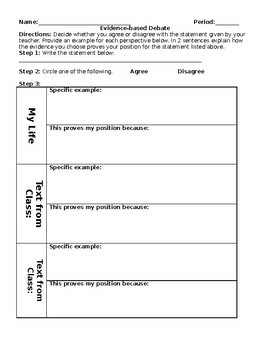 The product below is to help students brainstorm their position on a given statement that the teacher provides in order to argue that position during an in-class debate. Give students a statement based off of themes or ideas from the texts read in class. Then, the students will write the statement on their graphic organizer. The students will decide whether they agree or disagree, and provide an example from their own life, as well as an example from 2 different texts that the students have previously read for class. Lastly, the students will explain how their example proves their argument. The students will then use their graphic organizer to have an in-class debate.